Written by Kevin Burke. president and chief executive officer of the American Apparel & Footwear Association. The U.S. textile and apparel (T&A) industries have respectively adopted various restructuring strategies in recent years which fundamentally changed the way the two industries operate and the shifting relationship of each sector with imports. This study empirically tests the relationship between import penetration and the operation of the U.S. T&A industries based on data at 4-digit North American Industry Classification System (NAICS) code level from 2002-2008. Results from the panel data model show that overall the U.S. textile industry formed a weak cooperative relationship with import penetration level in the U.S. market and a neutral relationship was suggested for the U.S. apparel industry with imports. These findings contribute to understanding the global nature of today’s U.S. T&A industries and suggest useful perspectives for the U.S. textile trade policies. 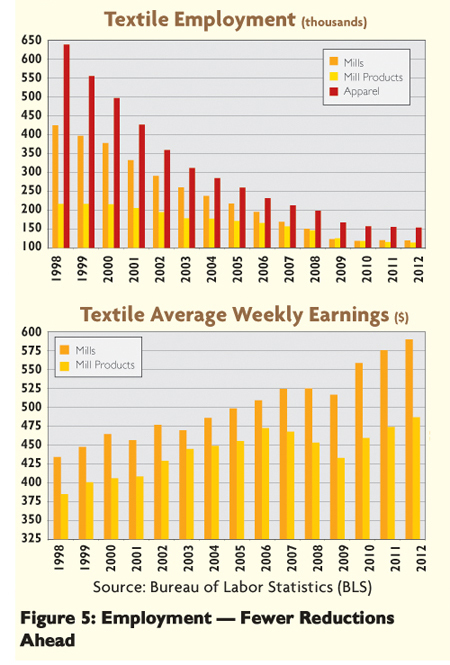 An annual report prepared by the Textile World on the outlook of the U.S. textile industry in the year ahead. The report covers topics ranging from the industry output, market evaluation, price, international trade, job market and policy enviorment. It is important to realize that the U.S. textile industry and the U.S. apparel industry today are no longer close parnters. Why? Because they choose different restructuring strategies in response to globalization and rising imports.